Although attending college is a goal for many high school students, for many Native American youth, attending college is something of a distant dream out of reach. Only 13 percent of Native Americans 25 or older have a bachelor’s degree, compared to 28 percent of other ethnic groups. Today, many Native youth express a desire to attend college, but a number of barriers to success still exist along the way. Getting to college is often difficult due to the geographical distances of many tribal communities from university towns. Native populations often struggle without computers and Internet access at home, which could provide an avenue for completing online curriculum. Additionally, once Native youth make their way to college, they are often underrepresented on campus, finding themselves without a community for the first time, and teaching in schools often lacks cultural understanding and relevance. 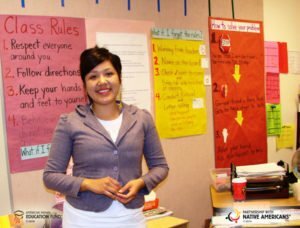 Although barriers to higher education cannot be eradicated overnight, many Native communities are working hard to provide youth with resources and encouragement to further their education and deliver sustainable contributions within their tribes and society at large. Access to college has been further improved by a number of scholarship programs that exist solely for Native Americans, and which can help students manage the cost of attending college. As university expenses continue to rise around the country, the prevalence of these programs is a welcome relief to many college-bound students. As more Native youth attend college, the path is more welcoming and clearer to those considering whether college is an option for them. This entry was posted in Humanitarian, Programs and tagged college, education, graduation rates, internet access, Native American, tribal scholarship programs. Bookmark the permalink. Trackbacks are closed, but you can post a comment.